Apple on Tuesday reported sales of $8.34 billion and a net profit of $1.23 billion for its fiscal third-quarter. Excluding quarters that fall during the holiday shopping season, Apple’s sales and profits for the quarter ended June 27, 2009, were the best in the company’s history. Apple’s numbers were driven by strong sales of both the Mac and the iPhone. The company sold about 2.6 million Macs during its third quarter, falling just short of the record for Mac sales set during the fourth quarter of 2008. As for the iPhone, the June launch of the iPhone 3GS helped Apple sell 5.2 million phones for the three-month quarter. 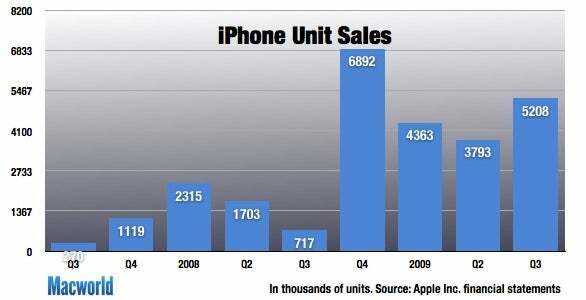 Year-over-year, Apple’s revenue rose 12 percent from the $7.46 billion in sales it tallied in the third quarter of 2008. Profits rose 15 percent from last year’s $1.07 billion net profit. In terms of earnings, Apple reported earnings of $1.35 per share, up 13 percent from last year’s $1.19-per-share performance. Wall Street analysts were looking for Apple to report earnings per share of $1.17. Analysts were looking for Apple to report $1.17 billion in profit and $8.20 billion in revenue for the third quarter. The 2.6 million Macs sold during the third quarter marked a four percent increase over the year-ago period. That performance comes amid a tightening market for computer sales. Apple chief operating officer Tim Cook noted that market-research firms IDC and Gartner forecast the overall market for computers to contract by 3 percent and 5 percent, respectively. As usual, laptops helped spur Apple’s sales growth. The company sold 1.75 million notebooks during the quarter, up 13 percent from the 1.553 million it sold last year. During the quarter, Apple overhauled its laptop lineup, cutting the price on many of its portables. Sales of desktops fell year-over-year, as Apple sold 849,000 during the just-completed quarter versus 943,000 in 2008. However, Apple saw a modest gain from the 818,000 desktops it sold during the second-quarter of 2009, as it reaped the rewards of the desktop updates it released in March. Cook conceded that some of that growth has come from “people that are buying up because they can now get a MacBook Pro for $1,199,” but said the price cuts didn’t signal a fundamental change in Apple’s approach to the market. The 5.2 million iPhones Apple sold during the third quarter marked a 626-percent jump from the year-ago period. Of course, last year, Apple didn’t launch the iPhone 3G until July 2008. The iPhone 3GS, released on June 19, accounted for more than 1 million of the phones sold during the quarter. “Response to the new iPhone 3GS has been tremendous, with over 1 million 3GS handsets sold by the third day after its June 19th launch,” chief financial officer Peter Oppenheimer said. The latest iPhone is currently available in 18 countries, with plans to roll it out to the rest of the 80 countries that make up the iPhone’s market over the summer. “We are currently unable to make enough iPhone 3GSes to meet robust demand, and we’re working to address this,” Oppenheimer added. Apple saw recognized revenue from the iPhone reach $1.69 billion in the third quarter, up from $419 million in the year-ago quarter. That’s due to the large number of iPhones sold, not just in the third quarter, but in revenue recognized from the previous two years’ worth of sales. Asked by an analyst about the iPhone’s progress in the enterprise market, Cook said the release of the iPhone 3GS and the iPhone OS 3.0 update had increased interest among large companies. Apple says that almost 20 percent of Fortune 100 companies have bought 10,000 or more iPhones while “multiple corporations and government organizations” have bought 25,000 phones. “”We think we’re at the tip of the iceberg with what the iPhone can do with business customers,” Cook said. If there was a downside to Apple’s third-quarter performance, it was in the iPod segment, where unit sales fell 7 percent from the year-ago quarter to 10.2 million. 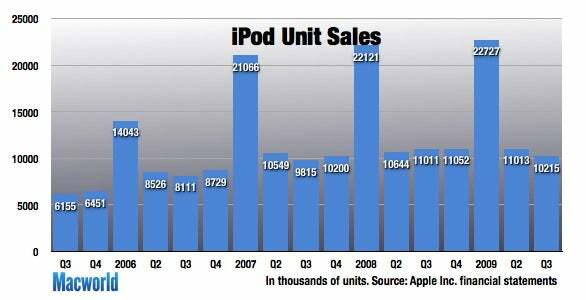 That was the first time Apple saw its year-over-year iPod unit sales fall. The drop was not unexpected, Oppenheimer said. Apple reduced its inventory of iPods by more than 400,000 units, while iPod sell-through rates fell 4 percent. Apple made the inventory reductions because of a drop in demand for traditional MP3 players due to the weaker economy and growth of the iPhone and because it ended the March quarter with a large inventory following the release of an updated iPod shuffle. Apple splits its portable devices into three categories—traditional MP3 players such as the iPod shuffle, nano, and Classic; the iPod touch; and the iPhone. Much of the decline came in sales of traditional MP3 devices. Even so, Apple sees some bright spots in its iPod business. The company’s research indicates that half of the people buying Apple’s traditional MP3 players are purchasing their first iPods. More impressive, sales of the iPod touch rose 130 percent year-over-year. Both the online iTunes Store and the brick-and-mortar Apple Stores saw a strong third-quarter. According to Oppenheimer, the iTunes Store saw its 8 billionth song downloaded last week. As for Apple’s retail efforts, the Apple Stores tallied $1.5 billion in revenue for the quarter, up from $1.45 billion last year. The stores saw 38.6 million visitors, a 22-percent rise from the 31.7 million who came into an Apple Store during the third quarter of 2008. 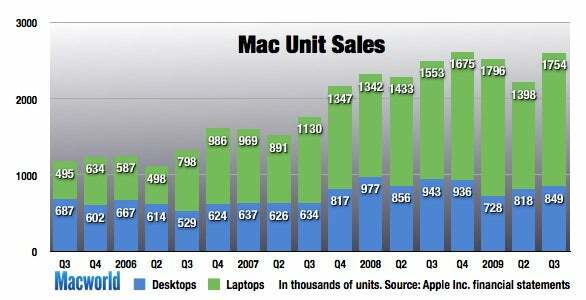 The stores sold 492,000 Macs during the just-completed quarter, with about half of those sold to new Mac customers. Apple opened 6 new Apple Stores during the quarter, while completing 27 remodels. Oppenheimer says Apple remains on track to open 25 new stores and remodel another 100 before the fiscal year ends in September. It plans to open its first store in France during the holiday quarter. The company ended the quarter with 258 retail stores. Looking forward to the fiscal fourth quarter, Oppenheimer said the company anticipates revenue of $8.7 to $8.9 billion and diluted earnings per share from $1.18 to $1.23. Prior to Tuesday’s conference call, analysts were forecasting earnings of $1.30 a share on sales of $9.05 billion. 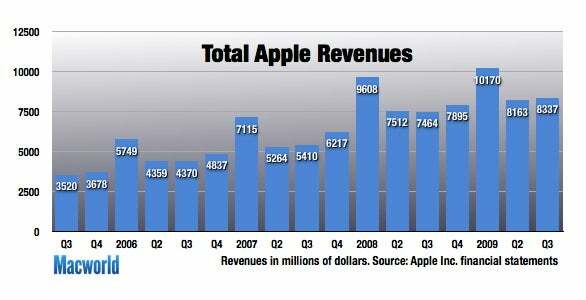 For the 2008 fourth quarter, Apple reported earnings of $1.26 per share and $7.9 billion in revenue. Pressed by analysts to expand on that guidance, Oppenheimer noted that Mac sales typically increase from the June to September quarters, and Apple expects that trend to continue this year. Sequential growth is expected to be less than in previous years, however, because of the recent updates to the laptop and desktop lines. Apple also expects to the decline in sales of traditional MP3 players to continue while the iPod touch “will grow significantly.” Oppenheimer said the company is very optimistic about the iPhone’s prospects in the September quarter but noted that Apple has limited experience with seasonality for a product that made its debut just two years ago. “We are very enthusiastic about the upcoming launch of Snow Leopard, and the enhanced performance and user experience it will offer to our Mac customers,” Oppenheimer said. Updated at 2:55 p.m. PT with more data on Apple’s third-quarter performance. Updated at 3:12 p.m. PT with more data on Apple’s retail efforts. Updated at 4:03 p.m. PT with comments from Apple executives.